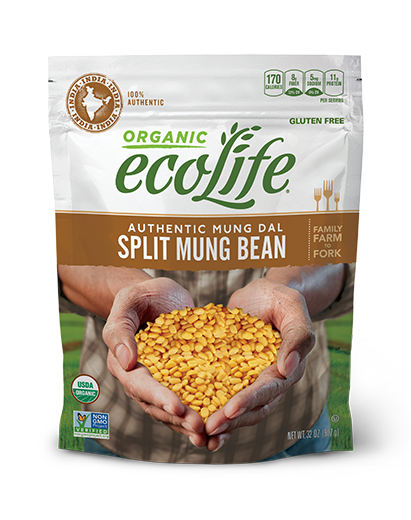 ecoLife® Organic Split Mung Beans are authentically sourced from India, where they are routinely used for both sweet and savory dishes. Mung dal is low in fat and cholesterol, high in dietary fiber and rich in protein, which makes it an excellent, healthy food choice. Combine 1 cup Split Mung Beans and 3 cups water in a saucepan. Bring to a boil. Reduce heat to a simmer (medium-low to medium), cover and  cook for 20-25 minutes. Add more water if necessary to keep Split Mung Beans submerged. When done, Split Mung Beans should be tender and soft. Combine 1 cup Split Mung Beans and 3 cups water. Never fill cooker more than half full. Bring to pressure on high heat. Reduce heat to low, but keep under full pressure and cook for 7-10 minutes.